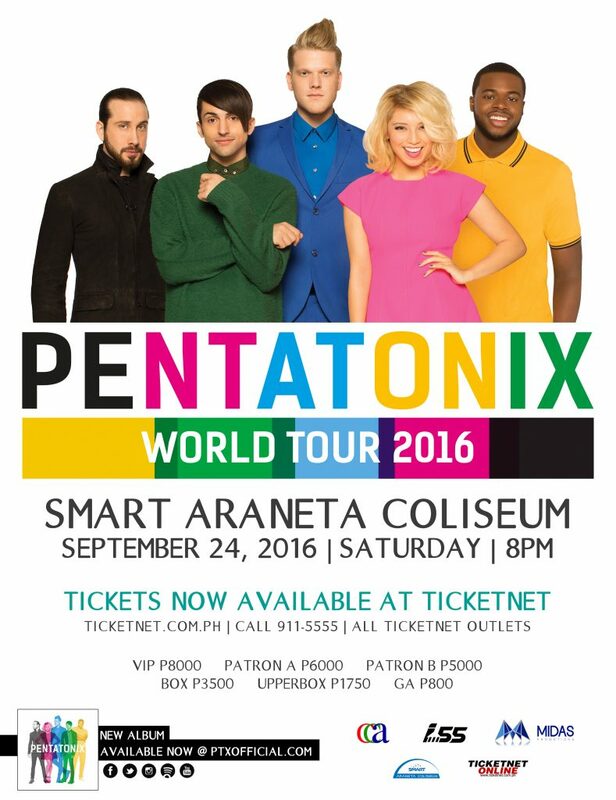 PENTATONIX are back in Asia this September with shows in Taipei and Manila! Since bursting onto the scene in 2011, multi-platinum selling recording artists Pentatonix have sold more than 3.2 million albums in the U.S. alone, won 2 Grammy Awards, sold out venues worldwide, have amassed over 1.5 billion views on their YouTube channel with over 10.5 million subscribers and appeared in the feature film Pitch Perfect 2. Their latest release, Pentatonix debuted at #1 on the Billboard Top 200 and Current Albums Chart and is certified gold by the RIAA. The first single, “Can’t Sleep Love” has over 18 million views on YouTube. The group’s holiday album, That’s Christmas To Me, is certified double platinum by the RIAA and features their recent 2016 Grammy winning track, “Dance of the Sugarplum Fairy.” All 7 of their releases have peaked within the Top 5 on Billboard’s Digital Albums Chart with 6 of those releases reaching the Top 10 or higher on the Billboard Top 200 Album Chart. Most recently, the group received 2 gold certifications for their “Daft Punk” medley and cover of Imagine Dragons’ “Radioactive” ft. Lindsey Stirling. That’s Christmas To Me was the 4th best-selling album of 2014. The group released their very first documentary (On My Way Home) which follows the quintet on their sold out 2015 North American Tour featuring behind-the-scenes footage, life performance and the making of their debut studio album, Pentatonix. The group continues on their 2016 World Tour in support of their self-titled gold certified album and their newest single, “If I Ever Fall In Love” ft. Jason Derulo.